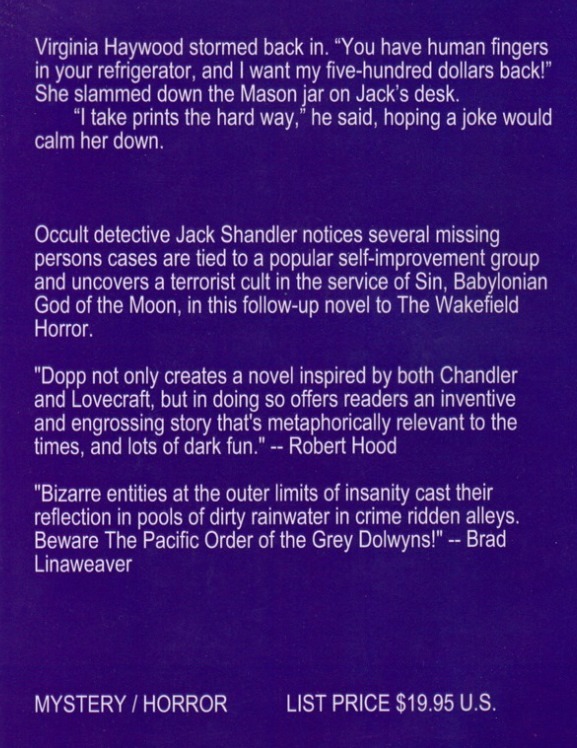 Babylon Moon picks up where The Wakefield Horror left off. A continuation of the further adventures of Jack Shandler and his merry band of acquaintances, old and new. Based out of present-day Hollywood, Shandler is currently enjoying a minor success with the book he wrote about his recent Lovecraftian adventures with the Great Old Ones. We find him dressing for a book signing and contemplating the shooting (in the foot) of a book reviewer with whom he apparently doesn’t see eye to eye. Unsurprisingly, Dopp’s hard-boiled hero with a heart as hard as marshmallows, is immediately knocked off track due to a local bank robbery that he just happens to be able to stop. This results in the loss of his gun to the local constabulary and the story is off and running. This time, our Jack gets mixed up with a missing scientist, his beautiful daughter (naturally! ), a tough-talking Valley landlady, some new clients, a retired lawman, unretired lawmen and The Pacific Order of The Grey Dolwyns. Oh. I almost forgot! Rattlesnakes. A little taste, on the back cover. 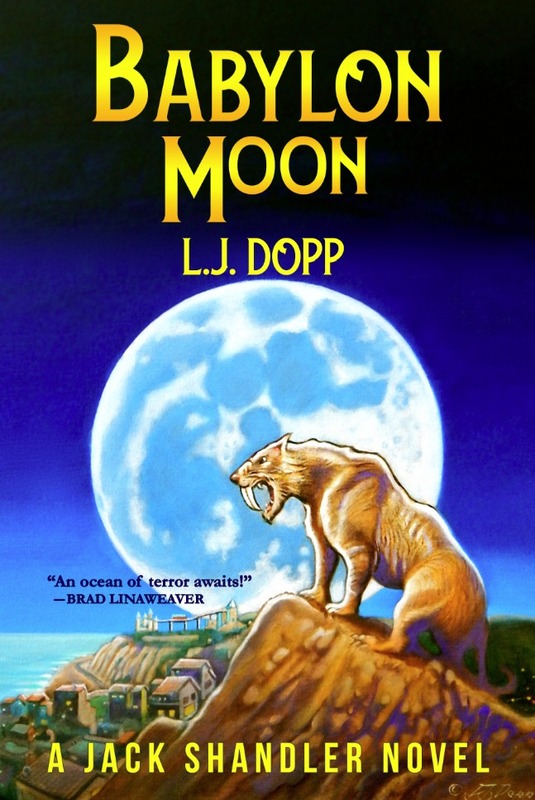 Dopp’s signature style in these stories is his amazing ability to drag you out of your comfy chair and into the streets with his characters. His descriptive abilities are marvelous and you are walking with his denizens and seeing all the same things as they. Smelling them, too. The action is non-stop as Shandler searches for the missing egghead and a pretty young dancer whose husband is frantic with worry. We are dragged all over town, over the hills to the San Fernando Valley and under the hills to the Pacific’s edge, trying to unravel this latest brain-twister. Characters disappear and reappear with alarming speed and I had to stop and catch my breath more than once while participating in this adventure. As with any proper science-fiction or horror story, the current situation is neatly (well, not really neatly) wrapped up and put away in the second-floor office filing cabinet on Hollywood Boulevard. The door remains cracked, however, for the next weird happenings that I have no doubt will affect Shandler’s future. I’m looking forward to finding where L.J. Dopp’s fevered imagination brings us next time. It’s grand to find a new set of characters and situations and disappear into their universe for a stretch of time, safe in the knowledge that no matter who you are or where you live, those characters peopling the story cannot follow you home. Order your copy today at Lulu. 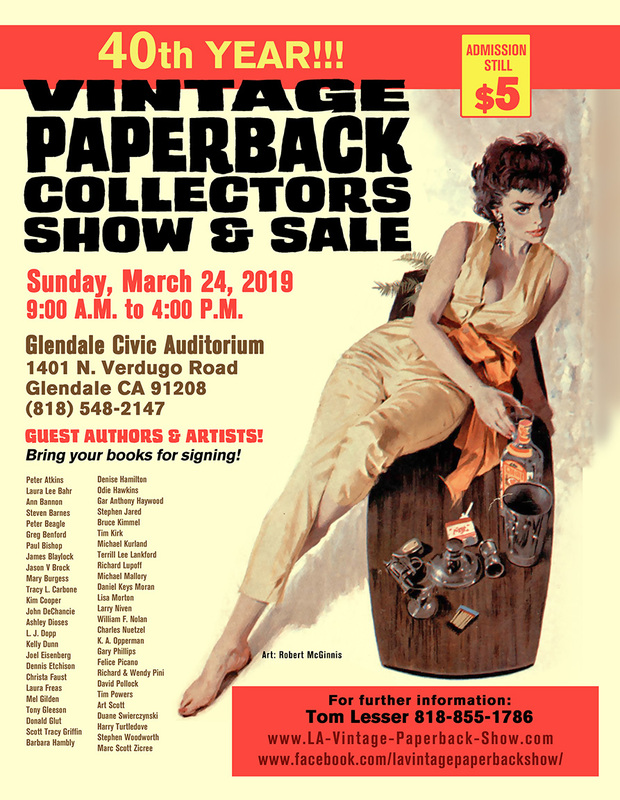 Mr. Dopp will be at the Paperback Back Show at the Glendale Civic Auditorium on Sunday, March 24.